Synopsis: Synopsis - Baki the Grappler: Volume 1 - Warrior Reborn (2001) Every warrior's life is but a moment. These fearless fighters exist knowing all too well that each moment could be their last. There is always someone stronger, or faster. There is always someone unafraid to go to any length to ensure victory, or survival. And at least once in each warrior's life, that warrior wonders what it would be like to be the worlds best. It is this great unknown, this passion for power that drives the Grappler. Each must choose to throw all else aside to achieve their goal, or forever shrink into the shadows, their potential unfulfilled. Feeling his training to be the strongest fighter in the world is going nowhere, Baki Hanma quits his program believing that the only coach he needs is himself. Baki stumbles on his first step into this new world. Will he learn from his errors and achieve his potential? Or will he forever disappear among the millions of fighters who never realized that one must crawl before one may walk?Synopsis - Baki the Grappler: Volume 2 - Grappler vs Gripper (2001) While studying up on his future competition, Baki soon discovers the true terror that is Kaoru Hanayama, a cold-blooded monster bent on the excruciating end of all who stand before him. Hanayama does not use weapons. He is a weapon! And now, events are set in motion that will bring the full might of the killer's colossal strength bearing down on Baki. However, what Baki doesn't realize is Hanayama means to fight this battle to the death! Finally, the answer to all of the build-up culminates in an epic battle between the two gladiators... waged on a very public battleground. Can even the best of Grapplers hope to withstand the flesh-ripping grip of an unstoppable titan like Hanayama?Synopsis - Baki the Grappler: Volume 3 - Jungle Warfare (2001) Baki is back! And this time, he's faced with his greatest challenge yet... a head to head battle with his father. With impossible odds weighing against him, Baki knows that his father, the undefeated Yujiro Hanma, will do anything to win. Now, with only one month to prepare for the fight, he must push his body and mind to the limit or die by the same man who gave him life.Synopsis - Baki the Grappler: Volume 4 - Tough Love (2001) Tension is high as the big showdown approaches. Baki gathers with friends and former foes from his past to engage in some last minute training before his father, Yujiro, arrives. It's Baki vs. Yujiro in a no holds barred grudge match to determine superiority once and for all! Or is there much more at stake than meets the eye? 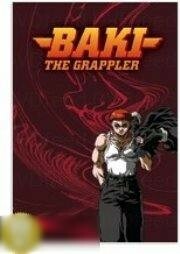 Whose side will Emi choose: The man she loves or the son who desperately wants to love her?Synopsis - Baki the Grappler: Volume 5 - Young Champion (2001) Baki has become the champion of an underground circuit known for employing some of the best fighters in the world. Tokugawa, the commissioner of the circuit, throws the best competitors he can find in Baki's path, to no avail: The Champ seems invincible! But two incredible adversaries await. A battle against an opponent with an unusual fighting style takes Baki to the limit of his abilities. With his arm disabled early on in the fight, Baki has to push through agonizing pain to survive the bout of his career. Should he make it out in one piece, he will face a wresting icon of mammoth proportions. Will Baki have the strength to bring victory to his name?Synopsis - Baki the Grappler: Volume 6 - King Hanma (2001) The King goes underground! When Yujiro appears in the underground arena and quickly humbles his champion son, he accepts a vigorous challenge from the patient Doppo. Doppo's secret ten-year vendetta is exposed to the younger generation's champion - as well as his tremendous abilities as a grappler. But Baki must remain focused. With his burgeoning friendship with Doppo on the line, he can't help agonizing over the possibilities of the elder warrior's bout with Yujiro. However, his own fate is in question as he awaits his match with a unique foe more concerned with nutrition and exercise than fighting. Kureha battles for the chance to prove the merit of years of research and seal his destiny as the supreme being on the planet.